In this second installment of Waiting on a Word’s What to Watch, we talk ZOMBIES! As you all know, I like me some sap. Beautiful stories about love and friendship and families warm my heart and make me cry. But guess what, Blogtropolis? I also love a good apocalyptic survivor story. I revel in watching drama unfold when characters find themselves in situations they never thought possible. And that, my friends, is exactly what happens in The Walking Dead. Currently in its third season on AMC, TWD returns from mid-season hiatus this Sunday. Woo-hoo! If you are in the minority of television viewers who aren’t watching TWD, fire up your Netflix and get to watching Season One from the start. NOW! I can hear you fellow sap lovers whining: Zombies? Yuck. It’s too gross. Trust me. TWD has something for everyone. Without giving any spoilers I’ll let you in on this tidbit. The series starts with our good guy, Rick (played by Andrew Lincoln), awaking from a coma to find that the world has been overrun with zombies. Rick gets his act together pretty quickly and ventures out into the new zombie-infested world to find his wife and son, hoping they survived the outbreak. Lots of awesome stuff happens along the way. True, there’s a bit of blood and guts, but I just cover my eyes for those parts. The story itself is worth the gory scenes. TWD gives us drama, fear, suspense, intensity, hope, love. At its central core is humanity. The survivors’ attempts to hold onto their humanity while fighting off “walkers.” The process of accepting what the world has turned into. Inner struggles and fears versus the outer strength and strategies needed to survive in a changed world. As we follow this group of people through their journey, we wonder what we would do in the situations presented. It’s great television. Give it a try- one episode- it won’t kill you (but maybe the walkers will… bah-hahahaha!). Not an episode goes by where I am not yelling at the television screen. Why are they going there? What are they doing? Oh my GOD don’t they see that walker creeping up on them? They are the dumbest people on earth! Intensely awesome! 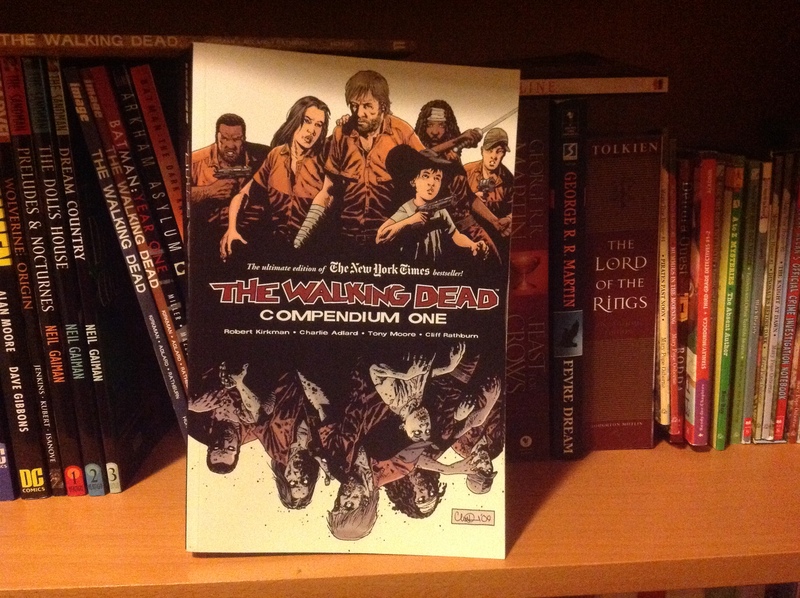 He’s read all of The Walking Dead graphic novels and constantly compares them to the show. He keeps telling me how great they are, but I’m just not into the graphic novel format. If any of you are, definitely give them a read! And, since this is my forum for writing about whatever I want, I’d like to put this out there for the record: Zombies are the BEST form of supernatural antagonistic creatures. Here’s why. Vampires are beautiful, charming and usually rich and cultured. However, us normal blood-pumping humans have little or no chance against vampires. Traditionally, they are faster and stronger and more cunning than us mortals. And if you’re a pretty teenage girl with a mediocre personality, forget it! You’re doomed to fall in love with an obsessed teenaged vampire and be turned into one eventually yourself. It’s just the way the cookie crumbles. Werewolves are somewhat normal until the full moon. Again, we have no chance against a man-turned-werewolf. They can sniff us out and overtake us, ripping us to pieces in mere minutes without giving us regular folks sufficient time to run away and hide. Zombies, however, are totally beatable. The slow-moving, dumb-as-nails zombies drag their feet and take their time approaching, grunting and snorting so they can’t even sneak up on you. If you have a weapon, you can shoot them in the head from a distance. If they happen to get close enough, you just swing something at them to knock through their brains. It’s not pretty, but any schmuck who can swing an ax can defeat a zombie. Also, when you kill a zombie, you don’t feel bad about yourself. Essentially, you are doing them a favor by putting them out of their misery. They aren’t people anymore and don’t have human qualities like vampires and werewolves. They are creatures stuck in purgatory, and by killing them, you send them to a better place. I think this is why people love a good zombie story. Usually, zombies are unlikeable and dim-witted (unlike vampires) and easily defeated (unlike werewolves). Average people can defeat zombies. Average people defeating zombies is the premise of TWD. It’s survival and drama and all the stuff that excellent television shows are made of. Try one episode! It’s worth your hour.